The highly-anticipated World Boxing Super Series (WBSS) opens its semifinals-round action this Saturday, when undefeated world champions Oleksandr “The Cat” Usyk and Mairiis Briedis battle in a title unification this Saturday, airing live from Latvia, starting at 2 p.m. ET, exclusively on Super Channel in Canada. Usyk (13-0, 11 KOs), the World Boxing Organization (WBO) Cruiserweight World Champion stopped former world cruiserweight champion Marco “Kapt’n” Huck (40-5-1, 27 KOs) in the 11th round of their WBSS quarterfinals fight. A two-time Ukrainian Olympian, Usyk captured gold medals at the 2012 Olympics and 2011 World Championships, in the process twice defeating current International Boxing Federation (IBF) Light Heavyweight World Champion Artur Beterbiev, the two-time Russian Olympian now based in Montreal. 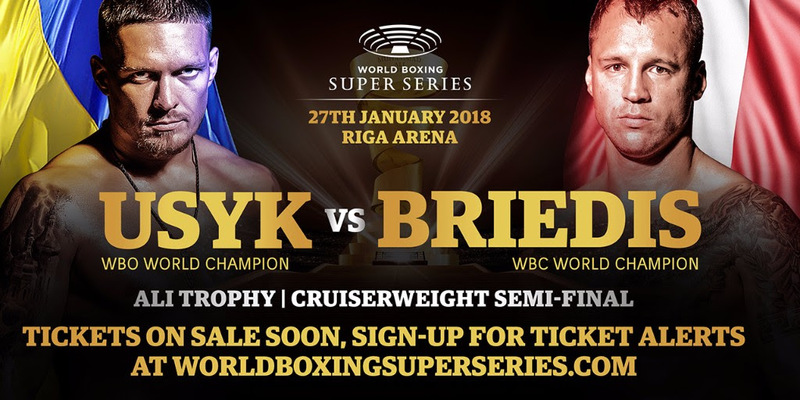 Briedis, the World Boxing Council (WBC) Cruiserweight World Champion, will be fighting in his hometown just like he did in the WBSS quarterfinals, when he won a unanimous 12-round decision over Mike Perez (22-2-1). A former kickboxer, Briedis defeated Huck last April to become the WBC champion. The Usyk-Briedis winner will advance to the WBSS championship final in May to fight the winner of the other WBSS semifinals match, Feb. 3 in Russia, between IBF World Champion Murat “Iron” Gassiev (25-0, 18 KOs) and WBA World Champion Yunier “The KO Doctor” Dorticos (21-0, 20 KOs). Five exciting fights on the “Usyk vs. Briedis” card, promoted by Sauerland Event, will air exclusively in Canada on Super Channel. In the co-featured event, Armenian-native Noel Gevor (23-1, 10 KOs), fighting out of Germany, faces 2008 Nigerian Olympian Olanrewaju Durodola (27-4, 25 KOs) in the WBSS Cruiserweight Substitute fight. Undercard matches also scheduled to air live on Super Channel include Swiss light heavyweight Yoann Kongolo (10-0, 4 KOs) in his WBC International Silver title defense against local Latvian favorite Andreis Pokumeiko (15-12-1, 11 KOs) in a 10-round bout, and Croatian heavyweight prospect Filip Hrgovic (2-0, 2 KOs), a 2016 Olympic bronze medalist, faces the United Kingdom’s Tom Little (10-4, 3 KOs) in an eight-round match to open the Super Channel broadcast. An eight-round match between Latvian cruiserweight Nikolais Grisunins (6-0-1, 3 KOs) and Jozsef Darmos (8-1-1, 7 KOs), of Hungary, is the swing bout. Super Channel aired major boxing events live in 2017 like Brook vs. Spence Jr., Pacquiao-Horn, Eubank, Jr. vs. Abraham, Lomachenko vs.Marriaga, Crawford vs. Indongo and Smith vs. Williams II.